Myopia, also known as nearsightedness, occurs when light rays focus in front of the retina instead of on the retina, and therefore causes blurry distance vision. 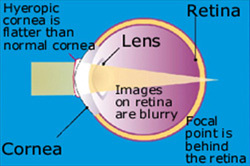 Light focuses in front of the retina if the eye is too long or the refractive power of the eye (primarily the cornea or crystalline lens) too strong. The traditional approach to correct myopia is by using eyeglasses or contact lenses to help move the light to the retina and provide clear vision. Refractive surgery (LASIK and PRK) may also be an option for those with myopia. Uncorrected myopia can also cause headaches or eyestrain. If you already wear glasses or contacts and experience headaches or eyestrain, or find yourself squinting, it may be time for a new optical prescription. Hyperopia, also known as farsightedness, occurs when light entering the eye does not come to a clear focus on the retina. 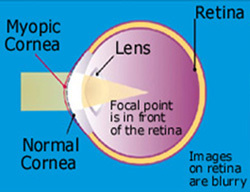 The focal point of the image is at a point behind the retina. This causes vision to be blurry at both distance and near if the hyperopia is a fairly high amount. If the hyperopia is a low amount, for example, less than +1.50 diopters, many young people can overcome the farsightedness and still see very clear at all distances. This is accomplished by contraction of the ciliary muscle in the eye, which causes the crystalline lens to become more convex in shape and thereby cause the images to focus closer to the desired point on the retina. However, even if the person can see clearly by overcoming their hyperopia they may get tired eyes and/or headaches. Additionally, uncorrected hyperopia in children and students can sometimes make it more difficult to study and read and thereby decrease their ability to learn. If you wear glasses and have these symptoms, you may need a new prescription. Glasses may need to be worn full time or just for near vision, depending on the amount of hyperopia you have. Hyperopia can be corrected with glasses, contacts, or refractive surgery. Astigmatism is a refractive error where light rays come to focus at two different points inside the eye instead of one focal point. This causes blurred vision. 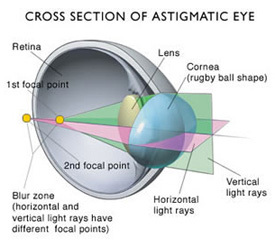 Astigmatism is due to an irregularly shaped cornea, toric crystalline lens or toricity of the retina. For example, if the cornea (clear window at the front of the eye) is shaped like the back of a spoon with two different radii of curvature, the light rays will be focused in two different areas of the retina after being refracted by two different curved surfaces. Astigmatism can occur with nearsightedness, farsightedness, or alone. Uncorrected astigmatism can cause eyestrain, headaches, and blurry vision at all distances. Astigmatism can be corrected with glasses, contact lenses, and refractive surgery. Contact lenses that correct astigmatism are called toric lenses. Both rigid gas permeable (RGP) and soft contacts can be worn to correct astigmatism. Our contact lens experts can determine which type of contact lens is best for you. Some corneal diseases, such as keratoconus can create an irregular astigmatism that create a blurred vision that can only be overcome with specialized contact lenses.